The Crown Casino and Entertainment Complex, located across 510,000 square metres (the equivalent of two city blocks) in the heart of Melbourne, Victoria, is the biggest casino in the Southern Hemisphere and one of the largest in the world. Built at a cost of $2 billion and opened to the public on May 8, 1997, the complex rakes in approximately $1.5 million in profit each day – that equates to $62,500 per hour, roughly $1,042 a minute, and $17.35 every second. The complex itself is Australia’s leading tourist attraction, and sits within the top 20 for the most popular attractions around the world. It contributes approximately three billion dollars in total casino taxes. Crown owns over 1600 rooms and villas across three different hotels; the Crown Metropol being the largest in terms of number of rooms with 658. Suffice to say, Crown is quite a profitable company and has done wonders for Australian tourism, entertainment and culture, with more than 19 million people a year visiting the complex which currently holds a license extending until the end of 2033. Crown Casino has over 500 table games and 2,500+ pokie machines (including slots and video poker). Slot machine betting limits start as low as one cent, with some VIP machines allowing bets of up to $5-$10 per spin. The major casino table games on offer include roulette, blackjack, craps, poker, pai gow, baccarat, casino war and sic bo, with other smaller gaming activities including the electronic version of roulette (Rapid Roulette), the big-wheel, tia to, and the electronic Vegas Star Roulette and Rapid Baccarat. If you are a regular visitor of Crown Casino and want maximum bang for your buck, consider signing up for Crown Rewards, a loyalty points system which lets members trade points for experiences and other redeemable goodies. By signing up for a Crown Signature Club Card and using it while playing pokies or table games at the casino, or at Crown Melbourne bars, restaurants, spas and hotels, you can rack up points easily to use later for prizes – or even to pay for future visits to the casino or eateries. If you are also a CrownBet.com.au member, CrownBet Rewards is of extra benefit to you. Just link your Crown Signature Club Card to your CrownBet punting account and all betting activity on the site grants you points. For racing stakes, every $2 gets you one Crown Reward/CrownBet Reward point, or $1 if it is on the fixed markets or exotics. For sports stakes, every $5 wagered gets you one point. If you’re a multi kind of guy, you get one point for every $1 you wager. All points are credited within minutes, and every 100 CrownBet Rewards points is worth $1. Remember: CrownBet loyalty rewards points can expire after six months if your account is inactive or you haven’t played at Crown Melbourne for a while, so make sure to maintain your account if you want to have a big payout with your points someday! Both single-zero (European) roulette and double-zero (American) roulette are offered at the casino – lower stake tables use the American design (ranging from a $1 betting minimum to a $5), while higher stake table use the European design ($5 and up). 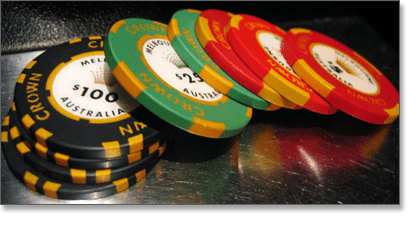 Crown Casino added double zero to its low-bet roulette tables back in 2008. 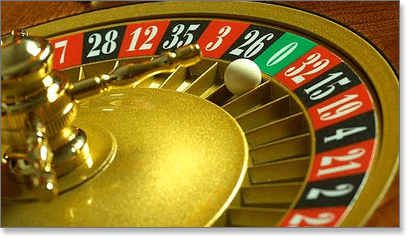 We recommend playing traditional European roulette in order to take advantage of the significantly lower house edge. There are close to 100 roulette wheels/tables within the casino, and each roulette station has table chips (different from traditional Crown chips discussed below) of different colours, with a unique number for that specific table – chips which can only be used at their respective tables. Rapid Roulette allows players to play the game at their own electronic terminal in front of either a live croupier who spins the ball, or in front of an on-screen roulette wheel operated by a random number generator (RNG). Players who play Rapid Roulette have the chance to win a jackpot between $100 and $1000. Each terminal is automatically updated with the result of the spin, winnings are paid instantly and loses are taken. A timer appears on screen to let you know how long you have in between spin to place your bets. Crown offers three distinct version of the game of 21: original Crown Blackjack, Blackjack Plus and pontoon. Blackjack Plus, one of the most skewed casino games in favour of the house, was introduced in 2012 and holds the rule that if the dealer draws to 22, he/she does not lose and no player is paid out – instead, the result is a ‘stand off’ and all bets placed are neither lost nor won. While this new variant of the classic blackjack game continues to be met with heavy criticism, it was approved by the Victorian Commission for Gambling Regulation. We suggest avoiding this game like the plague. Note: Crown also has other chips such as tournament chips and free play chips which hold no cash value. The Crown complex owns three world-class and prestigious hotels – the Crown Towers, the Crown Metropol and the Crown Promenade – as well as two luxurious day spas (Isika Day Spa and Crown Spa). The Crown Towers: 481 rooms & villas over 38 floors. 658 rooms across 28 floors. 465 room hotel on 23 floors. For more information about the hotels, visit the hotel section of Crown’s official website. The Palladium is the largest entertainment ballroom within the complex, with a seating capacity of 1,500. It hosts some of Australia’s premier functions including the AFL’s Brownlow Medal Count and the annual TV Week Logie Awards.